Phase One Media Pro™ is a professional photo manager that makes it easy to manage your photo and video assets. Built to be fast and intuitive, it is a powerful photography assistant that will supercharge the way you find, organize, and share your images and videos wherever your files are stored. Media Pro supports photo and video files from more than 100 different cameras and is built to manage large photo libraries. Find and select your images quickly. Magnify images and evaluate your images with correct colors, in high quality and including adjustments using Capture One’s professional image rendering engine. Drag and drop to import and add keywords and ratings for images and videos. Manage your library across multiple drives. Even when your originals are offline, you can browse, search, and annotate your images. 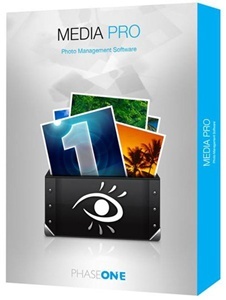 Process and organize thousands of images fast with Media Pro’s intuitive digital photo management tools, which are tailor-made for the professional photographer’s workflow. Rename on import, convert, or tag hundreds of files at a time with sophisticated batch processing, or use powerful search features to instantly find and retrieve your images. Edit your images in Capture One with its state-of-the-art editing tools and keep track of your changes with version control, while folder watching keeps your catalogs up to date. When it’s time to deliver, Media Pro can export your photos in exactly the format and size your clients need. It offers dozens of professionally designed presentation templates. Impress your audience with slide shows, videos, and web galleries.